Viber for Blackberry Download : Viber Blackberry app release date | Free Pc to Phone Calls, Free Voip Calls to India International ! Thanks for your review of Viber! If you have any question about Viber - please feel free to ask. Thanks Viber Team for dropping by. Will Viber work for Blackberry Playbook as well ? At this stage, we're working on Viber for Blackberry cellular devices only. We invite you to follow us on Facebook and Twitter for the latest updates and news. Thanks Viber team for the info. when will we get the viber setup for blackberry mobile ? As confirmed by Viber team, viber setup application for blackberry will get released very very soon..within few days. We are in the last days of beta testing. Viber for BlackBerry [beta] to the AppWorld for your review as well. We hoped that the beta testing phase would be completed by the end of March, but some obstacles were hit and we are doing our best to finish the development of the app accordingly. But really ... I was thinking about switch to Android. Come on, Viber and RIM!!!!! There are many people waiting desperately for Viber for BlackBerry. Wow thats good to hear :) CANT WAITTTTTTTTTTTTTT!!!!!! what is the exact date for launch of VIBER for BlackBerry ? Waiting in antipication for Viber! !Please give me a date. I hope we see it in a couple of weeks in App World! woow, viber team also comment on here. Have you got a definate date for this app yet ? We will be announcing its publication, system req. and more, at that time. In other word, Viber for BB won't see the light of day any time soon. You know, it's ok to tell it like it is... After all, we've been waiting since June 2011, so why not keep us waiting 2 more months, to officially make it 1 year since you're developping an app that's "coming soon"! You've been copying/pasting that sorry excuse everywhere. You've been claiming Viber for Blackberry will be released "soon" since June 2011, then recently in a matter of days, which turned into a matter of weeks. Clearly you're in the same situation as us... you have no idea what's going on. You know, it's ok to say nothing, or that you don't know, instead of giving users false hope. And from experience, you can test an app all you want, there will still be bugs... the imperfection of the app for iPhone and Android is living proof for that, and neither will it be perfect for Blackberry. So just release the app already!!! As we explained, the beta phase is about to be over very soon, and then we will deliver the app for RIM's final review. Once that's over, Viber should be officially released to AppWorld. In the technological world, it is common that unexpected obstacles are hit, but we prefer delaying the release a bit more than planned rather than releasing a half-baked product. We apologize for the delay, and rest assured that it is also in our huge interest to release it ASAP. I was contemplating switching to iphone a few days ago, but since i foudn out viber will be available on blackberry i will stay with RIM. Viber for BB is long over due, should have been available years ago! I hope this is true and we will in fact be able to use viber on our blackberry's. I just bought BB 9930 but will be replacing it with Android too. Tired of waiting. No Skype, no Viber. I just bought BB9930 but will be replacing with Android too. Tired of waiting and doubt if BB viber will be coming soon. No skype, no viber, goodbye BB. why don't you give a date??? week has already gone by and no viber still. plz give a date !!! Oh please do give us a date? I'm planning to get a BB phone but if we still can't get the viber app then I might get an android instead and I really do like blackberry. Unfortunately we still can't give an exact release date. If all goes as planned, it should be ready within the next couple of weeks. We are implementing last-minute fixes and adaptations. If all goes as planned, it should be ready within the next couple of weeks. As we've explained, we are working around the clock to bring you Viber for BB as soon as we can. We still wouldn't want to guarantee anything, but if all goes as planned, we hope that it is ready within the next 2 weeks. If the app is somewhere, pls let us do a beta test of it. Send me a link to download at i.smartbuddy (at) gmail (dot) com. So, you admit you are still working on the beta phase and when finished the app will be delivered to RIM for their final review. Can you possibly say how long RIM are likely to take with their testing? Hi just a Question. Like we whatsapp without any internet plan on our fone.. will it be possible to do the same with viber? Coz it's too expensive here and i would rather use my wifi at home..
Whilst I think that Viber will be great for Blackberry users why would RIM allow the use of Viber to be free. They do not allow Skype calling between BlackBerry users to be free. Or was this the doing of Skype themselves. I use Viber on my HTC and it works really well. Thanks. We are not sure we understood your question entirely... If you meant to ask whether or not Viber will use BIS network - then yes, Viber will "prefer" using BIS data than regular 3G data. About the release dates - we are working around the clock to upload the finished product to AppWorld as soon as we can. We hope it is ready very soon now. I am using Viber on my HTC and it works really well. Why would RIM all Blackberry users to use Viber to make free phone calls when they are unable to use Skype free on their Blackberries? Is this RIM's restriction or Skype? I am wondering if Viber would support BlackBerry Curve 9300 ? Hi I want to know abt rls dt. It is clear these guys are not under pressure. In a normal business they would not exist anymore as they even can not estimate their "production". To be honest and respect your clients means good business, so viber guys should change their "soon" approach to a more profesional one, least where they can estimate the year of the issue. I cant understand blackberry's approach to this issue, i know tens of people who already shifted to iphone and android phones cause they cant install neither viber nor skype on their blackberrys. This " coming soon " thing they keep on mentioning is obsolete in the world of technology where things change each second. so wake up BB it is already too late for you. 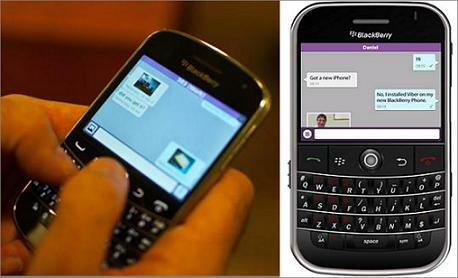 Viber should support all BB devices with OS5 and above. I cant understand blackberry's approach to this issue, i know alote of people who already shifted to iphone and android phones cause they cant install neither viber nor skype on their blackberrys. is viber ready yet for BB? got to keep in touch with my love ones,, and if BB cant to that soon , like real soon (3 more days) then i have no choice but to switch to Iphone. Agree'd, blackberry is so far behind than the latest iphones and android powered phones, in my case and alot of other's cases, if it wasn't for BBM, i woulda BEEN gone to iphone.. blackberry 10 is supposed to be a hit tho on the other hand, or at least even compete with iphones and andoirds ! Many thanks to all at Viper. So the long wait was almost worth it. I for one can live without calls for the time being. Be assured I will report any bugs I may have. And I hope all Blackberry users will do the same. Let's make the BlackBerry the best smartphone their is for Viber. i got viber on my blackberry curve 8520 i gave it my number and my international (ireland) it never sent me the code and when i press the link for one sixty seconds i do the same process on the browser and nothing happens some one help please????????? Please try removing Viber, wait 24 hours, reinstall and try again (make sure you try both the SMS and the automated call options). If this doesn't help, contact our support team at http://support.viber.com and give them the details of the problem. There is no viber for the playbook os version 2.0.1.358??????? hi! when are you expecting to have a version with free calls available? When will the "free calls" available for the blackberry? Releasing the beta version with messaging only is only the first step. We are working around the clock to bring the VoIP feature to our fans, and we hope to complete it within the next few to several months. We'll keep you posted with news. This first version (beta) has been out there a long time ago. I had it installed about 1.5 years ago. The new RIM OS is currently being developed and might bring some new hope. It's just remarkable that even old apps are like skype are not there. I guess RIM will have to live with people switching to android or i phones, if they don't solve this issue quickly. As we've already explained, releasing the beta version with messaging only is only the first step. We are working around the clock to bring the VoIP feature to our fans, and we hope to complete it within the next few to several months. We'll keep you posted with news. I am not able to download viber for my blackberry curve and was wondering when it will be available? thanks. What problem exactly are you experiencing trying to download Viber? Please try to be more specific. I am an avid fan of the Viber application. I bought Blackberry because I thought Viber runs on it. Unlucky, Viber in Blackberry only supports texting and some other features but not calls. I'm currently jumping from one site to another reading all the forums about Viber in Blackberry. I have hope. I know that very soon the Viber for Blackberry full version will be released. We are doing everything within our power to bring the calling update to our fans with Blackberry. Once we have news, we promise to inform our users. It's still under development, but unfortunately we still don't have concrete news. When we do, we'll publish it officially through our Facebook page. You may try contacting the authorities and ask for the reason for this block. why is viber not available in playbook? but it is available in ipad and android tablets..
Viber is not available for Playbooks at the moment. We hope to make it available in future versions of Viber.